Kinmont Willie, most infamous of Scottish Border Reivers was eventually captured by the English following a ‘Day of Truce’ at the Dayholme of Kershope. The ‘Day of Truce’, purportedly held at monthly intervals was a time when those Border Reivers who had transgressed the Border Law were brought to the very Border Line to answer for their crimes. The Kershope burn is still the Border between the countries of Scotland and England, the Dayholme an area of flatland on its Scottish bank. Tom Moss has researched the historical records and woven this into a fictional account of his rescue from Carlisle Castle. Kinmont had been taken against the ‘Assurance’ of the Truce. His capture by the English was illegal and, even though they sought to hold on to him against all the odds, they would suffer a miserable humiliation for their rash effrontery. Kinmont was freed following a daring raid on Carlisle castle by a small party of clansmen, all Border Reivers, from the Scottish Border valleys aided and abetted by members of some of the more prominent Cumbrian families. 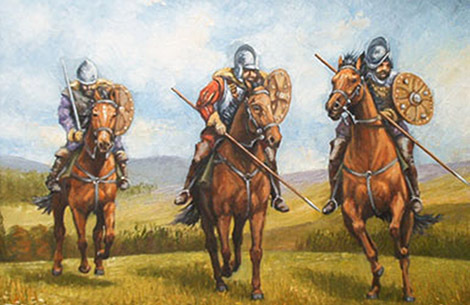 The most notable of the English Border Reivers clans, the Grahams, also played a major part. The rescue led to a war of words between the monarchs, Elizabeth l of England and James Vl of Scotland. Their relationship reached its lowest ebb over the affair with warnings that the two countries had been at war before for reasons of a less magnitude. 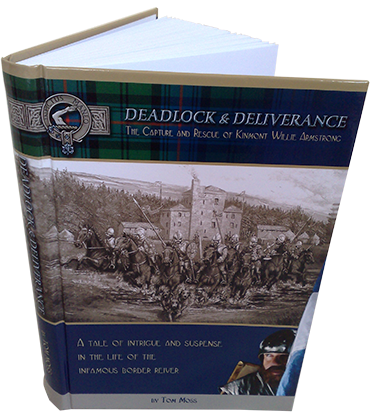 ‘DEADLOCK & DELIVERANCE’ is the story of Kinmont’s capture and rescue told from two perspectives. The facts as recorded in the primary sources of the time are explored to the full to give a factual account of the event. In turn these have been used to weave a fictional version of the story. Along the way the main characters involved, both English and Scottish Border Reivers, have been carefully considered and evaluated with some surprising results that take the capture and rescue of Kinmont to a new level. 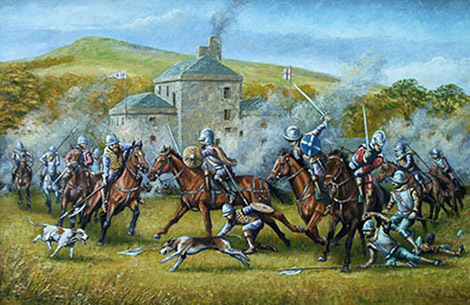 The story of the capture and rescue of Kinmont Willie Armstrong, the most notorious of the Border Reivers of the sixteenth century. The English/Scottish Borderline had been established centuries before his time but was still subject to raid and counter-raid as English and Scottish Border Reivers vied for dominance over each other. Kinmont Willie Armstrong was instrumental in much of the depredation that infested and beset the Border lands of the two counties. He was much prized by the English who wished to see an end to his nefarious activities.